FANBOY PLANET.com . 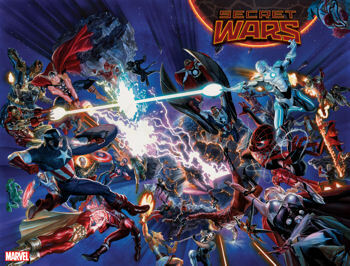 : mc-secret-wars-1 :. Since Secret Wars is the culmination of years of plotting by writer Jonathan Hickman, we should have expected this. If you haven't been following the years of plotting by writer Jonathan Hickman, or at least the last five or six months of it, Secret Wars is almost incomprehensible. Almost, because it is, at least, an interesting science fiction story involving parallel earths and humanity trying to escape its complete destruction. Most of them look like characters you know, but how they got there, who they're allied with, and what they're doing -- that's all a big game of catch-up. It's a complex story to get us to a complex situation that may spin out simpler stories. It's a weird approach, because Marvel has usually done a great job of providing recaps so new readers can jump right in. With the publicity this book has gotten, it would seem that would be something they'd want to do. Instead, there's the cast page that has been running in the front of The Avengers books for the past few months, but no explanation as to why they're allied the way they are. Even the Free Comic Book Day prelude was a bit strange, focusing on the kids of the Future Foundation having to deal with this very fatalistic viewpoint: most of humanity is about to die. Some will be saved on giant space arks. This is not a dream; this is not a hoax; worlds are colliding. 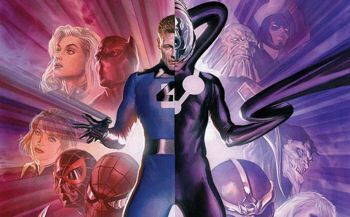 Now, getting past this, where new readers will likely be left in the dark -- holy crap, Hickman is a mad genius. Secret Wars is tense, taut storytelling with a lot going on -- maybe even too much -- beautifully drawn by Esad Ribic. It's a chewy book requiring a couple of reads to follow everything and determine just who is surviving and who is not and still it leads us to... what the heck is going to happen to the Marvel Universe? The next few months may not actually tell us, instead giving us spin-offs on Battleworld, that will allow creators to play around with some great high concepts and probably will be extremely fun for new readers. When a series begins with the Earth getting destroyed, you know it's restored something vital that mainstream comics are all too often losing these days -- the sense that anything can happen. So if you're a regular reader, by all means pick this up and savor it. If you're a new reader, you may want to just jump to the Secret Wars tie-ins that feature concepts that attract you -- Where Monsters Dwell, Armor Wars, Age of Apocalypse, Age of Ulton vs. Marvel Zombies... there are some fun-looking books coming. And likely, from issue #2 forward, this title will be more accessible as a whole new set of ground rules get laid out. It IS likely. After all, anything can happen.